For the most scenic hike, begin from the lower trailhead in the park, which includes the Twin Falls Natural Area. 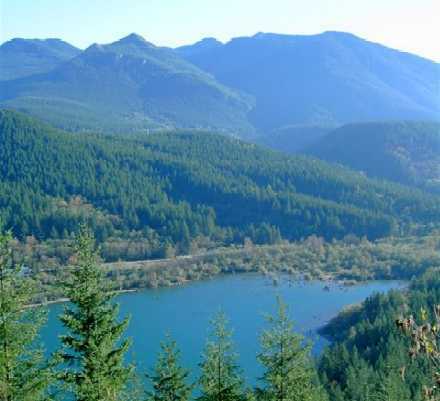 It is only 1.5 miles to the state-of-the-art bridge over the South Fork of the Snoqualmie River and views of Twin Falls. Those wanting to stretch their legs can include the overlook at the upper falls. Beyond the upper falls, the trail connects to the Iron Horse Trail and you can hike as far as time, conditions and energy allow. The Chicago, Milwaukee, St. Paul and Pacific Railroad grade was once part of the longest electric-powered railroad line in the world. It was in operation between 1908 and 1980. The trail follows the Snoqualmie River the first half-mile through ferns, ancient trees and wildflowers, dipping down to the river's edge at times. It then climbs away from the river and passes the Grandfather Tree, protected by a fence. At about a mile, a stairway descends to an overlook of the dramatic lower falls. The main trail continues to the bridge and views of the deep pools between the lower and upper falls. Admire the engineering that went into construction and placement of this bridge. The two wooden beams that seat the bridge were lifted in by helicopter. It is about 100 yards from the bridge to the upper falls overlook. From the upper falls overlook, the trail climbs to a broad plateau with a scattering of big logs to sit on -- a good lunch spot. There are no views, but it is very quiet and pleasant. 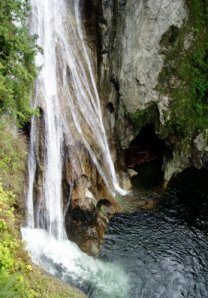 From the lunch spot, it is about a half-mile to the Iron Horse Trail and then another .7 mile to a feeder trail that descends to the upper trailhead and parking area for Twin Falls. The Iron Horse continues eastward. Directions: Lower Twin Falls Trailhead -- Drive east on Interstate 90 and get off at Exit 34 (468th Avenue). Turn right on 468th Avenue Southeast, drive about a half-mile, then turn left on Southeast 159th Street. Continue a half-mile to road end, parking area and facilities, elevation 600 feet.